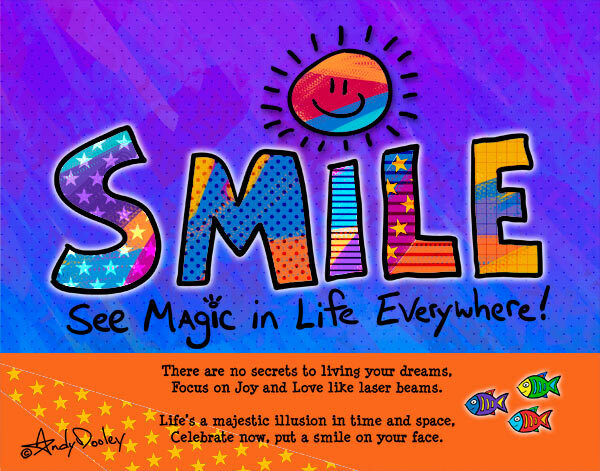 SMILE – See Magic In Life Everywhere! Home/Law of Attraction/SMILE – See Magic In Life Everywhere! I love that everyone has a SMILE and everyone looks great when they wear their smile! What makes you smile? Below is my newest creation of art! I hope it makes you SMILE. Did you go to UC Santa Barbara? I went to Ringling School of art and design! Sarasota, FL. YES YES YES!!!!!!!!!!!!!!!! It really did bring me a smile…… as does all of your effort and enthusiasm. I pinned it to my Pinterest board on ‘quotations’ which has a TON of followers. Hopefully some new eyeballs and hearts will be introduced to your work as a result.